After looking at a ton of grill tools we narrowed it down to what we think are the best grill and BBQ tool sets. We looked at the price, customer ratings and out impression of the over-all quality. This is out handpicked list for this year and will be updated every new grill and BBQ season. Many people grill and BBQ all year and that is why we try to update our list all the time. For any type of grilling you will need utensil. We have added pictures for you to click on and find out more on the grill tool set of your choice. We have collected the top 5 best grill tool sets that will give you the best bang for your bucks and are a greart gift for any backyard griller. Mr Bar-B-Q 18 piece stainless steel with storage case. Available in Black, Stainless steel and 36 Piece sets. G&F 20 piece stainless steel BBQ tool set. Vonhaus 18 piece stainless steel grill tool set. Aluminum storage case to carry your utensils with you. Home-Complete BBQ tool set with 16 accessories. There are some basic must have grill tools you need. We have collected the top 3 stainless steel tongs for the grill. A good tong will make your grill life a lot easier. 2 for the price of one. Works like scissors and this makes it easy to use. Measures 6 x 3 ich. Great for hamburgers. This one is a little larger with its 12.5 x 3 inch. Wide surface makes it very easy to use. Weber qualtiy. A good fork is a grill accessory that we definitely need to have in our arsenal of tools. We have found the top 3 for you. New Star 13 inch wood handle grill fork. Stainless steel and a wooden handle is a perfect combination. With 14″ this fork will make it possible to keep your hands away from the hot grill. Weber is known for their quality. Basting your meat is the best way to keep in moist and not dried out. A good baster will improve your cooking and give better results. We recommend these 3 as a good buy! This baster comes with an easy to use cleaning brush. With a removable tip this drip-less baster is easy do clean. This baster comes with an injector that can be placed at the tip. TIP! If you prefer a basting brush you can find them here! 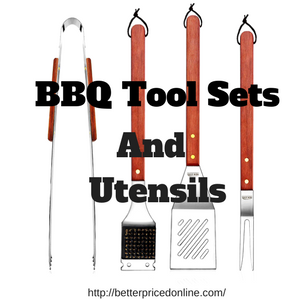 These BBq Tool sets it just one of the many outdoor products we review. You can find them all by clicking here!